Ruhla´s history was strongly influenced by decades of division. It was first officially mentioned in 1355 as a town divided between different authorities and lords. During the 17th century the administrational boundary which followed the Ruhla River that runs right through the town centre became the federal boundary. In 1640 the heritage of John Duke of Weimar was divided between his sons and as a result one half of Ruhla belonged to the duchy of Saxony-Gotha while the other was part of the duchy of Saxony-Weimar (Eisenach). Thus the borderline between the two duchies was the "Erbstrom&quot. The separation was maintained until the foundation of the federal state of Thuringia in 1920/21. 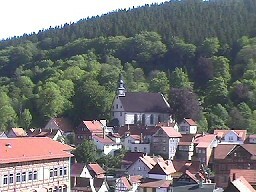 Ruhla being shattered into three totally independent congregations lead to enormous hurdles in the territorial development as well as to differences, misunderstandings and arguments, which finally hindered the collective use and upkeep of the church "St. Trinitatis" (left) in the Gotha part of the town. The division of Ruhla and the resulting argument between the churches (which was transformed into a play by the native writer Arno Schlothauer and put on stage by the folklore club "Alt-Ruhla" in 2001) made it necessary to build the angle church of St. Concordia (right) in the Weimar-Eisenach part. 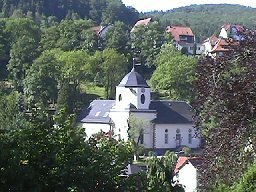 The history of St Concordia begins with the congregational meeting in Ruhla-Eisenach on September 23rd, 1658, in which the citizens agreed to the building of a new church after it had come to arguments between the members of different congregations during church services. After lengthy negotiations both dukes signed the "Separation-Recess" on January 10th, 1660, which abolished the community of churches and schools in Ruhla and allowed the Eisenach part of the congregation to build their own church and school. The construction was begun immediately. The planning and supervision was done by the princely architect Johann Moritz Heinrich Richter from Weimar. During the celebration which marked the opening of construction on March 20th, 1660, he had the members of the congregation and the guests mark the ground plan of its design with their bodies. The church would have two wings at a right angle to match the conditions of a landscape. The men in the crowd marked the right wing, the women marked the left wing, just as the real building would be used. Where the two wings met, the architect had all the children standing where the altar would be. It was a brilliant idea of the architect and an unconventional solution to the problems posed by the prerequisites to build the new church of Ruhla with two naves, each the size of a village church, at a right angle. "Like the swallow artfully smoothes her nest to a wall, the princely architect has built the church at a steep mountain and without care for conventional shapes he gave her two wings to clutch the mountain firmly as though she had arms." Note: Thanks to Helene Pawlitzki for doing the english translation!